SBG Norcal Wrestling Coach Geoff Millard was in St.Catharines at SBG Niagara to share his 5 part Wrestling for BJJ Program. Geoff has wrestled since he was a kid and was an All-American in College, giving him years of experience and insight into the game. 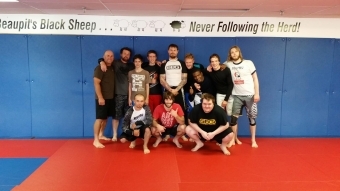 In attendance were SBG Niagara Coaches as well as students who have only participated in our Striking Program, so they had no previous grappling experience. A testament to Geoff's coaching and system is that EVERYONE was able to learn and implement the skills taught right then and there. That alone tells you how fundamental the system is and how quick someone can pick it up. It is a very well laid out system that focuses on fundamentals and movement. Most wrestling coaches I have encountered were interested in showing me how many ways they could take you down, which means very little to me if you can't show me HOW you are setting things up. This is where Geoff excels. He focuses on movement, posture, and pressure, which make the possibilities open up to the athlete. Every participant was moving and applying the concepts taught in such an improved manner within such a short time frame, it was rewarding to see as a Coach. Geoff has a very relaxed teaching manner, uses lots of humour to keep people relaxed yet focused on the task at hand, and he genuinely wants to help EVERYONE improve. He has a wealth of life experience that he selflessly shares with everyone, and as good of a coach he is, he is an even better person. Thank you Geoff for helping us earn our 1% better....I look forward to having you back anytime you would like!